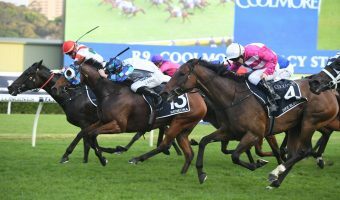 Saturday’s $2 million Magic Millions Guineas (1400m) came down to a nail-biting three-way photo between favourites Boomsara, Outback Barbie and Bondi. Boomsara entered as a $4.00 second-elect behind $2.25 favourite Outback Barbie, but it was the Chris Munce trained three-year-old that prevailed at the finish line. 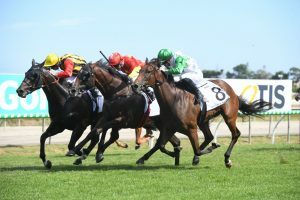 Jockey Tim Clark fought the whole way down the straight to challenge Bondi, who ran a heck of a race to finish second. Clark proved there was nothing unlucky about barrier 13 as he enjoyed the run of the race, kicking home the Spirit of Boom colt with less than 100m to go. 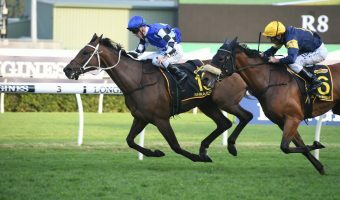 Boomsara (yellow/black silks) claimed his third win on the Gold Coast track during Saturday’s Magic Millions 3yo Guineas. Photo Credit: Steve Hart. The win was extra special for Clark, who credits Munce, an ex-jockey turned trainer, for Boomsara’s success. 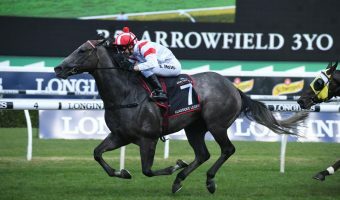 “It’s always good to ride for ex-jockey’s, they look at the races and can tell who’s riding well, it’s always good to win for him in Queensland too,” Clark told Sky Racing. 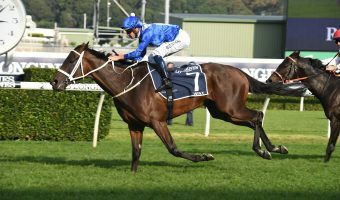 Boomsara originally led from the barriers, but surprise hopeful Bondi made himself known down the straight challenging both favourites in a dash for the line. As for Outback Barbie, it was a case of too little, too late as he found himself a stride shy. “Child berth and this, it’s been fantastic. He’s such a professional trainer, his whole stable are fantastic, I can’t believe it” part-owner Geoff Sinclair said when asked on the win. 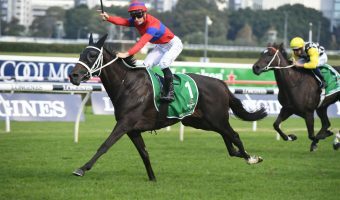 After replacing original ride Damian Browne, who was rushed to hospital for emergency surgery midweek, Clark kept the jockey in his thoughts.